Before I begin today's Life with Lynnie (LwL) entry, I must mention that my friend Mary Ann Lehmann of Invis, received some pics from Monday's wine and cheese contest celebration that I wrote about over the last two (2) days. Thank you Mary Ann, for forwarding them to me! 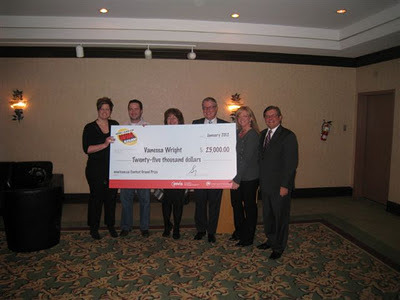 In this pic, from left to right, is Vanessa Wright (winner of the contest, who received the prize of $25,000), Vanessa's husband, A, J, D & S... who is President of Invis/Mortgage Intelligence and the fellow who lived for many years in the neighbourhood where I mostly lived, growing up! Although this pic is not very clear, I'm sure you get the idea. 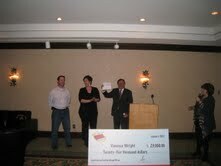 S is presenting Vanessa Wright and her husband the paperwork and real cheque in the amount of $25,000, while A announces congratulations! Once again, thank you, Mary Ann. I appreciated attending this evening! Thank you also, to Invis/Mortgage Intelligence for sponsoring the contest and providing the prizes to both the winner and her mortgage agent/friend, as well as the wine and cheese celebration event that I attended as their and my mortgage agent friend, Mary Ann Lehmann's guest. On Wednesday, February 1st at 6:30 p.m., I was once again at Heritage Park Alliance Church (HPAC). Not for a church service, but for a fun-time! Bob Cates and his assistant/wife CJ entertained those who were in the crowded sanctuary. In addition, they made sure they had audience involvement of two (2) children and one (1) adult. I must say, it was a wonderful experience, not just watching the show. You see, at the end, Bob gives a gospel message in a manner suitable for children to understand. What a blessing! I pray many came to Christ, that evening. I pray Bob and CJ will be blessed by God, in many ways. Yes, they travel from place to place, entertaining at events such as this one, and leading those to Christ, as God provides. This brings up a question I must ask. What do you do for Christ?